Sa Jolie – Featured shop! The holiday shopping season is here, and this week’s featured shop is SAjolie! SAjolie is filled with shiny, beautiful accessories for all occasions. SAjolie is owned and operated in Texas by Lindsey. She is an ex-pat from Derbyshire, England. Throughout her life, she has always been inspired by the French. She previously owned a store selling chic French furniture and décor. Lindsey inherited her love of French things from her Grandma, and spent her summers in the romantic French countryside. Sa Jolie means “it’s pretty” in French, and this shop is a French-inspired jewelry boutique. SAjolie is overflowing with a large variety of custom necklaces, earrings, bracelets, key rings, and key chains. This little boutique holds a collection of French-inspired, spiritual, Christian, charmed, and vintage jewelry. There’s an eclectic fusion of bohemian, spiritual, cowgirl, and charm. You can find something for everyone you know in this fabulous shop. All jewelry comes in a beautiful gift box or hand stamped gift bag. Gift certificates are also available! 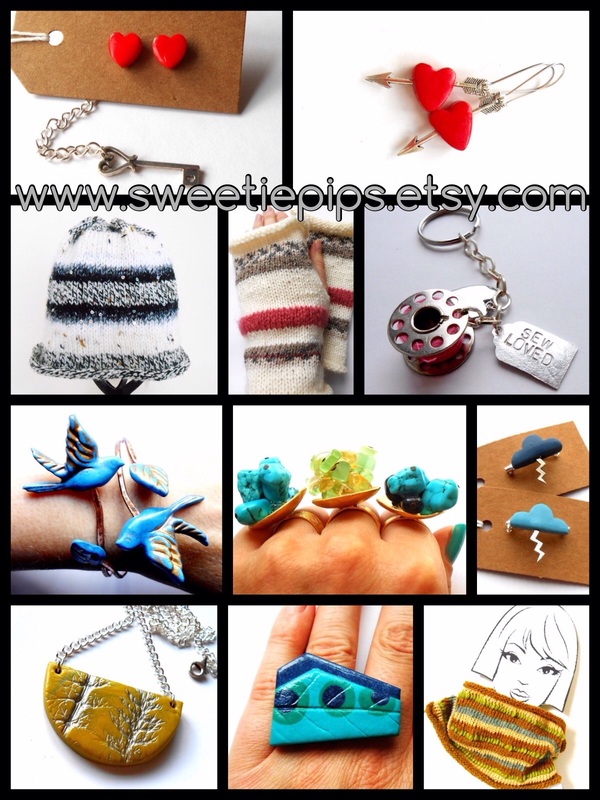 Just in time for Valentine’s Day, our featured shop is Sweetiepips! This shop offers a large assortment of unique and gorgeous jewelry and knitwear. Every item listed is handmade and ready to ship. Sweetiepips is owned and operated by Katrien. Her shop is located by the sea in Brighton, England. She loves to learn and experiment, is addicted to crafting and creating things, adores poetry, listens to punk and folk music, and loves books. She takes inspiration from the past and present; vintage and contemporary fashions and styles. She approaches each of her creations with eagerness, excitement, and whimsy. Her passion for her craft is plainly shown in each piece she creates. This shop offers an array of fingerless gloves, cowl scarves, hats, necklaces, bracelets, bangles, rings, earrings, pin brooches, lapel pins, keychains, and some destash supplies. Along with all of the things listed, Katrien is always happy to discuss custom orders and alterations. All of her creations are affordable and simply breathtaking.